Compass Point Recruitment is delighted to be supporting The Suffolk Apprentice, a new initiative hoping to give a great start to someone in the county who has a great business idea. Up for grabs is the chance to win £5000 plus a year's coaching from the Business Growth Coaches Network, all to help you make your dream a reality. If you are over 18 and have a business idea that you need help developing then this is your chance. 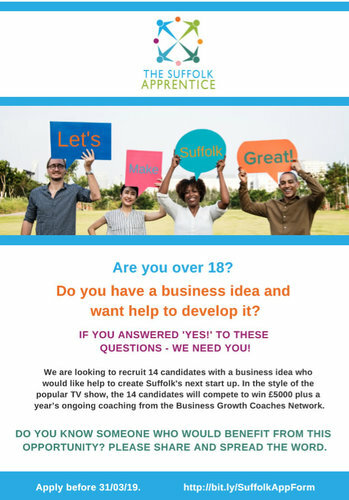 The Suffolk Apprentice is looking for 14 candidates to compete for the prize over the coming months. You will be asked to complete a series of tasks - such as marketing, planning, sales, fundraising, influencing - with each task supporting a Suffolk based charity. "We are delighted to be supporting this initiative as not only will it assist a number of local charities but it will also help grow a local business. Over the last 25 years Compass Point Recruitment has used its recruitment expertise in supporting local organisations across Suffolk and East Anglia from their initial start-up and then further through their journey of growth."